The Claims Are Rosy, But Brazil's Rain Forest Is Still Disappearing Brazil says it has greatly reduced the rate of deforestation. That may be true, critics say, but they argue such figures are misleading because so much of the Amazon has already been degraded. 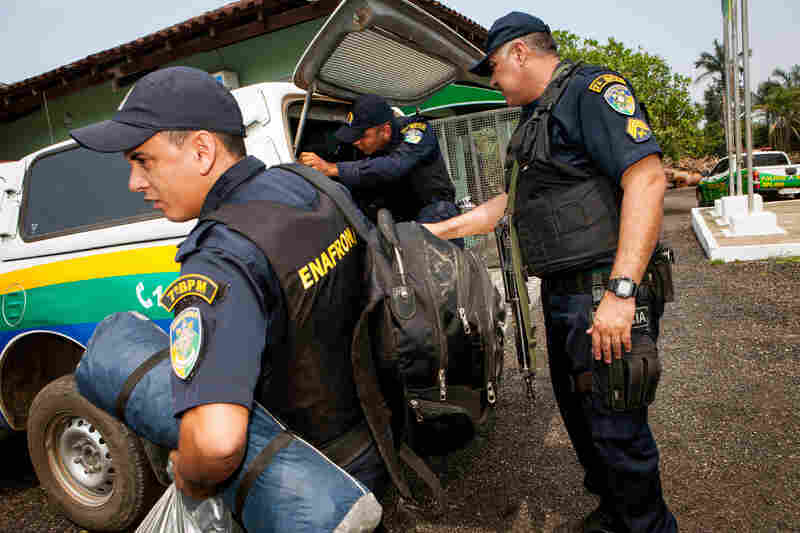 An NPR team joined Brazil's environmental police, the Ministry of Defense and other government enforcement agencies as they carried out a joint operation in the Jacunda National Forest in western Brazil. They seized timber that had been cut down by illegal loggers. Officers and agents organize equipment as they get ready to launch the operation. As the convoy prepares to enter the forest, the burning trees make it too hot to continue. The Brazilian environmental authorities were established to stop this kind of burning, but they say they lack the resources to have a major impact. 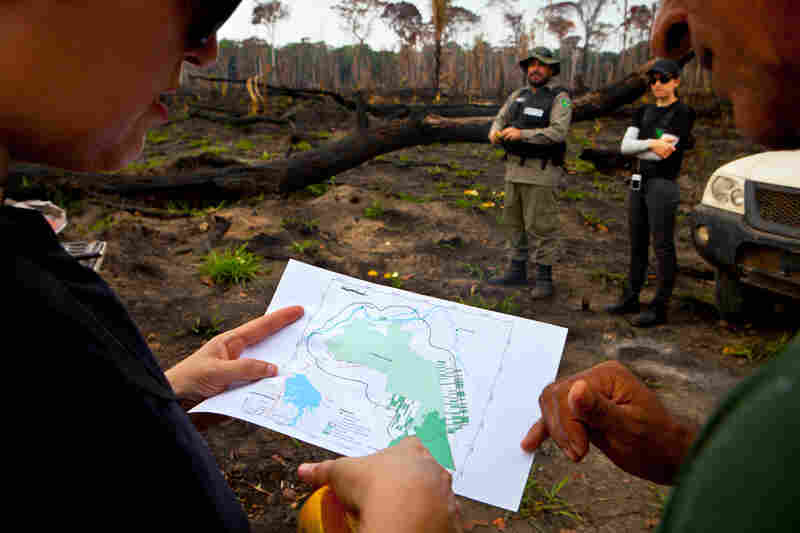 Members of the environmental team survey a map of the Jacunda National Forest during their operation. The team checks trees that have been cut down and burned. 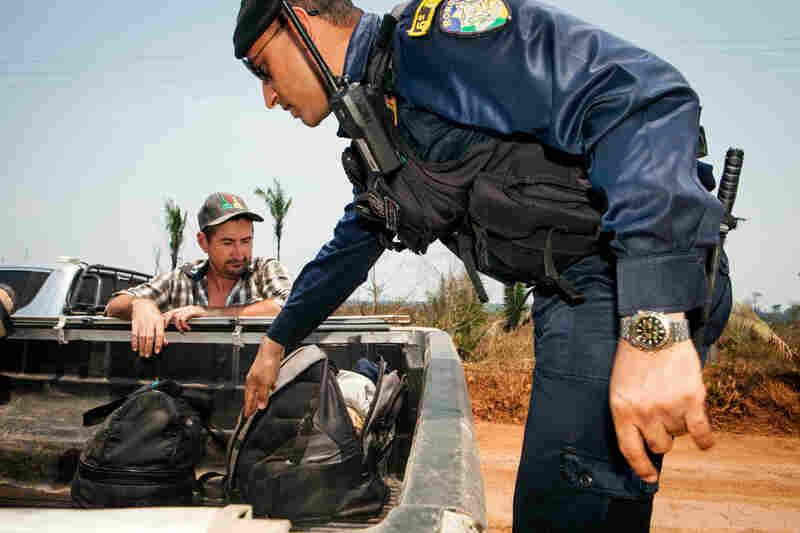 The environmental authorities, working in a convoy that consists of large pickup trucks, stop passersby and inspect their cars for signs of illegal activity. 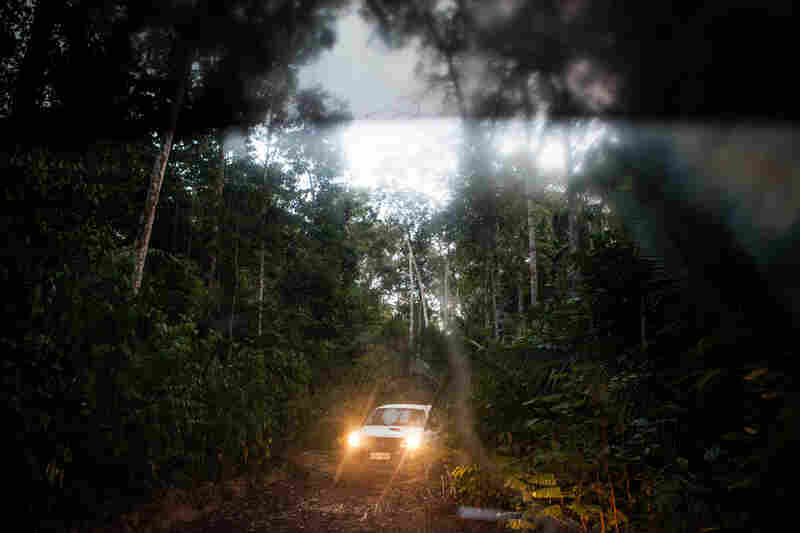 The convoy drives deep into the reserve looking for signs of illegal logging. 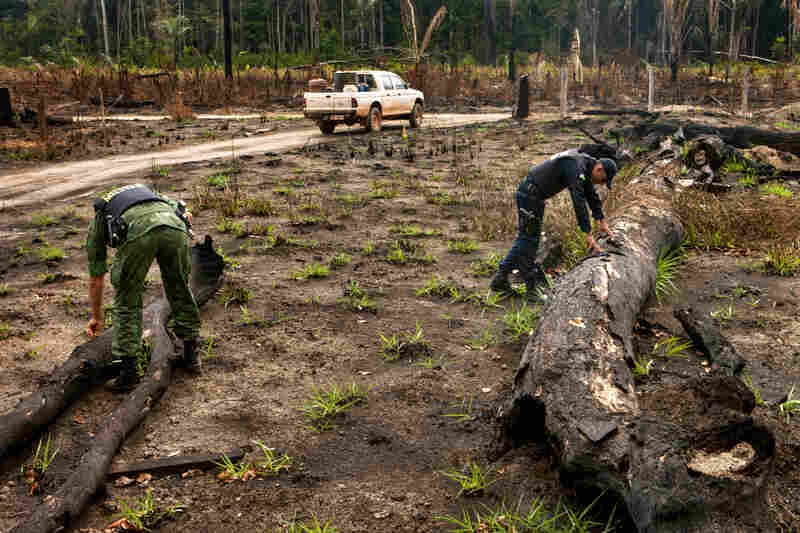 Brazil isn't lying to the world about how bad deforestation is in the Amazon. But it is, according to the very people employed by the government to protect the rain forest, "misleading" the international community. According to the government figures, the rate of deforestation is down dramatically over the past decade. And there's a general consensus this is true. But critics say the numbers don't tell the whole story because so much of the Amazon has already been damaged or destroyed. 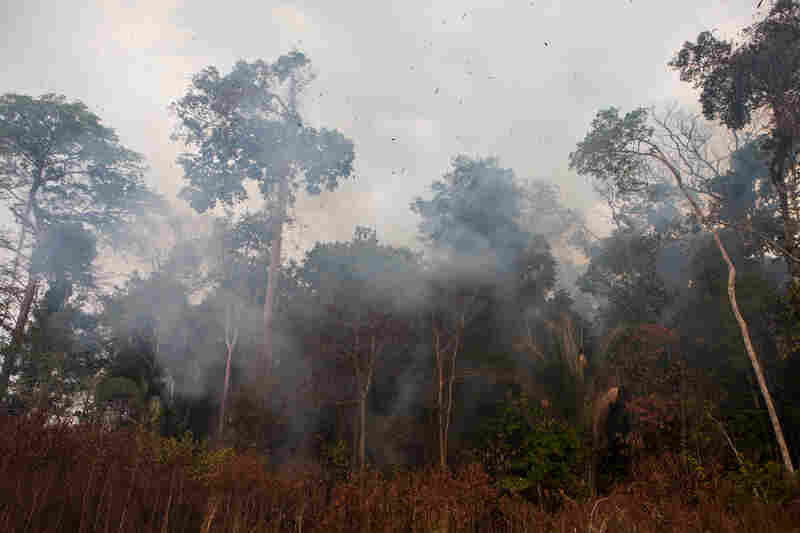 And the country is still losing about 2,000 square miles of jungle each year. The problem is that Brazil's Amazon region has a dual identity. On one hand, it is sovereign Brazilian territory. On the other, the world claims it as something vital for all of humanity. The Brazilian government is caught in the middle. It needs to develop the economy in a country where many still live in poverty. Much of that growth comes from soy and cattle ranching — activities that directly lead to the cutting of trees. But Brazil's government also needs to satisfy the international community that it is a good steward of the environment. Many governments around the world actually pay for Brazil to do that — Norway, for example, has given Brazil $1 billion to protect the rain forest. Our time with the environmental police demonstrated how difficult protecting the rain forest is when there are so many competing interests. Trees were burning all around us. The heat was too intense to continue. And the authorities say they are greatly outnumbered by illegal loggers, farmers and others who are tearing down the jungle. Some news reports will show flashy raids by helicopter on illegal logging camps deep in the forest. You won't hear about that below. In Rondonia, a small Amazonian state in western Brazil, the environmental police just had their only helicopter taken away in budget cuts. 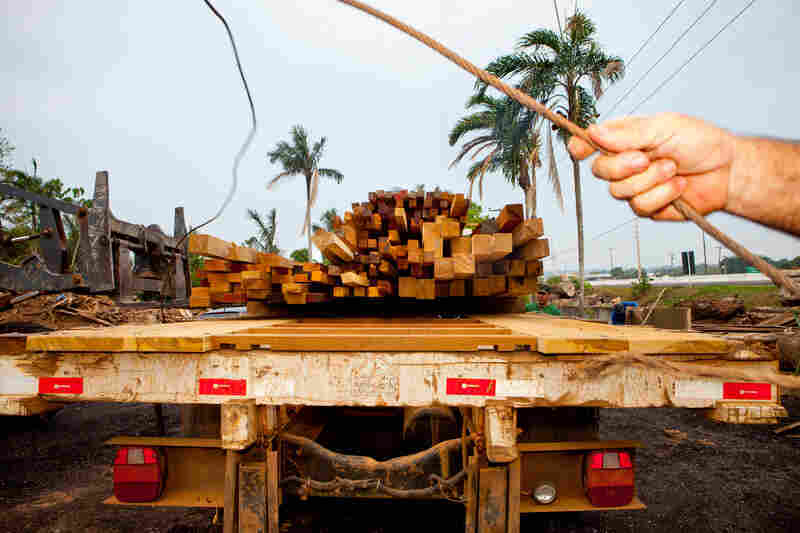 The people on the ground tell us that deforestation is "out of control."